Junction boatman Gavin Brown shares with us the perfect fly summer salmon fishing fly and the reasons why. The Silver Stoats Tail (the original pattern, the Stoat’s Tail, was attributed to James Wright of Sprouston) is a simple fly in construction and material content. 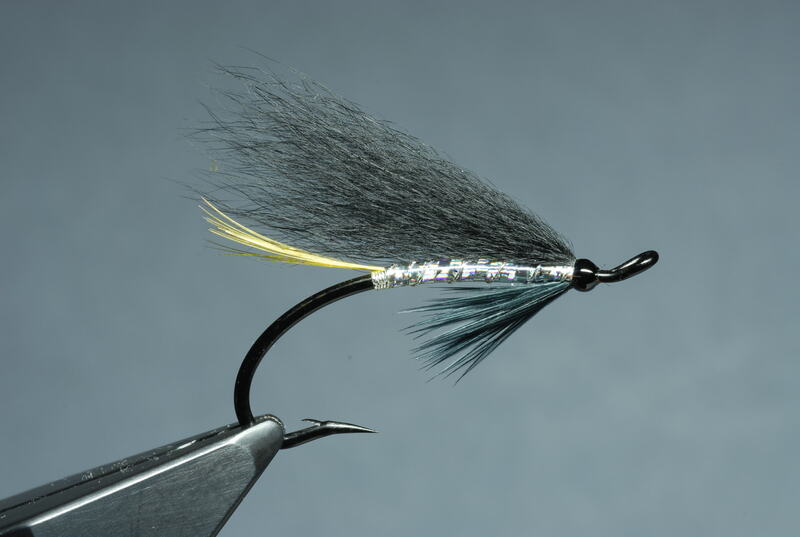 The fly provides a nice, slim silhouette in low clear summer conditions and is excellent for grilse and sea trout. Fish the fly at varying sizes. Big, heavy stream size 10. Change to a 12 when the stream starts to die out. Really bright conditions fish the fly on a 14. Every now and again use a silver stoat tube to get to the bottom, cone head or copper tube. Fish the fly squarish with a few upstream mends as the water gets slacker towards the end the stream, add a downstream mend or two. Very successful Tweed and Spey summer fly. Dressing: A Golden Pheasant tail, silver tag, body and rib, Stoat’s tail hair wing and a few black hackle fibres for the throat. These days many variations exist; a holographic tinsel body and a black Arctic Fox wing as in the example above, a recommended fly for the beginner to attempt. Anyone that has had the privilege to share time on the river bank with Gavin will know immediately he is a fly tiers fisherman, always thinking about the pattern for the conditions, using modern materials and methods in constructing his flies in an attempt to outwit the silver tourist. Gavin is always on duty when on the river bank wanting the fisherman to succeed. Enjoy his company, it is something to savour. Thank you Sean for your feedback – our Marketing Director used the same fly with Sky Sports Tight Lines presenter Keith Arthur last week on the River Tay where he caught his first salmon.